Daffodils are in full bloom, spring is in the air and we are in full swing with an exciting programme of events, parties, weddings and dinnersfor this year and 2018 too! If you’d like to see highlights from 2016, take a look at our video and please do leave us your comments. The beautiful Wallace Collection provided the perfect backdrop for this ‘bringing the outside in’ themed event. We were thrilled to be involved in this drinks reception for 200 at The Wallace Collection, which provided a great opportunity for Belmond to showcase their stunning properties around the world, giving their representatives the opportunity to network with event planners, buyers, DMCs, wedding planners and other key clients. 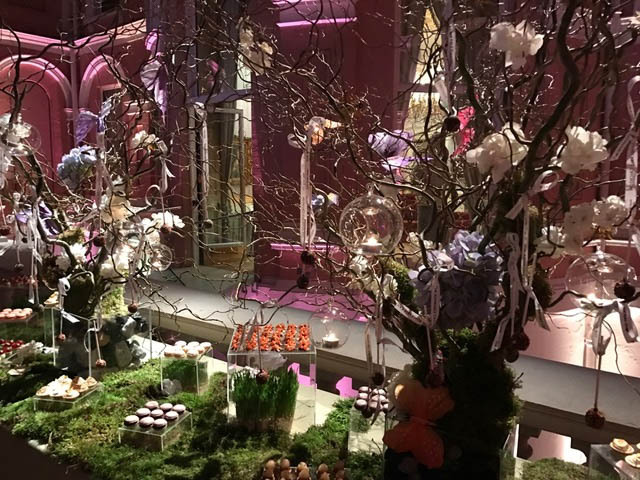 A ‘bringing the outside in’ theme was achieved by utilising the existing trees in the courtyard, enhanced by the creation of mini gardens of English flowers by the florist, Wild about Flowers. The guests were impressed by the English country garden pudding bar and canapé menu representing each of the countries where Belmond’s exclusive hotels are located. Click here to visit our website for other blogs and get inspired for your next event.